On November 8, 2013 there was an electrical fire that burnt down most of the orphanage. Thankfully, everyone was able to escape the building and no-one was injured. Currently the children and the caretakers are staying in a rental house nearby. We are still recovering from this tragedy. We are so lucky to have found a nice temporary home. However, renting a place for 20 children in Kinshasa is too expensive and we will not be able to stay much longer. We are working to try and rebuild as soon as possible. Please help us raise money for construction. The orphanage is located in the commune of Kinsuka in Kinshasa, DRC. Spread out along 100 ft x 90 ft, the grounds are enclosed by a concrete wall with a security guard stationed at the entrance twenty four hours a day. After it's completion in 2000, the orphanage opened up to the community and was dedicated by his Eminence, Frederic Cardinal Etsou. Originally, it had capacity for 12 girls. Today, with the help of bunk beds, it houses 14 girls and one boy. The orphanage hopes to eventually expand the building and take in more children. Click here to see photos of the Orphanage when it first opened. 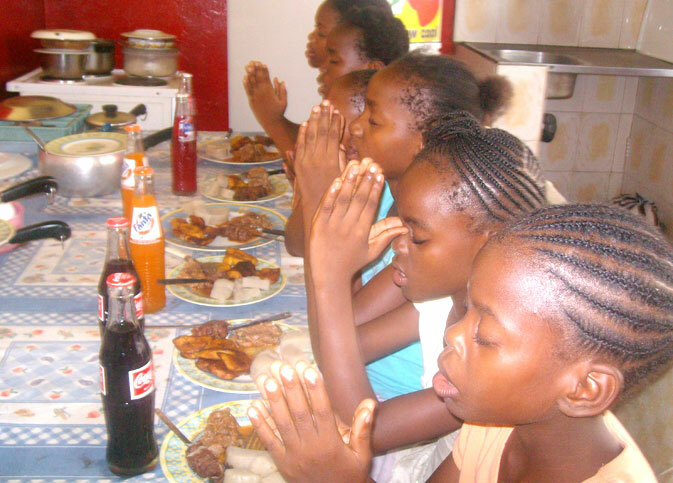 There are currently 4 million orphans in the country and many of them wander the streets of Kinshasa uncared for. Children have lost their parents to AIDS, war, and famine. Girls are sexually abused and often turn to prostitution to support themselves. The Admirable Mother Orphanage is acknowledged as one of the best in the country and always has a list of children waiting to be admitted. Expanding our current facilities is thus a top priority. The residential neighborhood surrounding the orphanage is not fully developed but both a hospital with three physicians and a police station are within walking distance. The orphanage receives telephone service, running water and electricity. In fact, development of the orphanage brought these facilities to the area for the first time. The orphanage also uses a back-up generator to help with night-time study sessions as the electricity is still unreliable. There are two showers, a tub, a bathroom sink, two indoor toilets and one outdoor toilet. The kitchen also has a sink, an electric range, a large freezer and refrigerator. There is a vegetable garden within the grounds but food is also purchased each morning at the local market. Waste is disposed of in a dry-well in the premises. Click here to see photos of the Orphanage now. We like to think of our orphanage as a large extended home. Child care is the work of three local women, referred to by the children as "mamas". "Mama" is a term of respect for a mature woman. (Elisabeth Heiser was always referred to as "mama Heiser".) The Mamas act as true mothers for the children. They provide love and support, they prepare all of the meals, and they keep the orphanage in order. Each night two of the "mamas" stay with the girls as a source of comfort and security. These mamas are widowed women from Kinshasa who have dedicated their lives to caring for the children. There are also three security guards on staff, two on duty throughout the night and one during the day. The guards are quartered in an adjacent building within the orphanage compound.